You demand secure carton seals, even when applying packaging tape by hand. It’s why Shurtape has added the Folded-Edge Hand Dispenser to the ShurSEAL Packaging Solutions family. 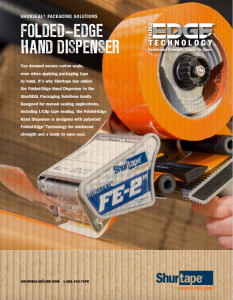 Designed for manual sealing applications, including L-Clip tape sealing, the Folded-Edge Hand Dispenser is designed with patented Folded-Edge® Technology for reinforced strength and a ready to open seal.